STARKVILLE, Miss. 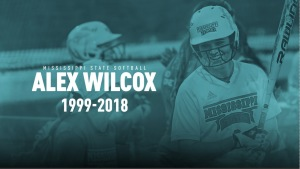 – After inspiring the Starkville and softball community with her courageous battle with ovarian cancer, Mississippi State softball will honor Alex Wilcox by retiring her jersey the day before celebrating her life with an on-campus memorial service. Dubbed the “Snowman” by her teammates and family, Wilcox’s jersey will be retired on Saturday, Sept. 15 in a special halftime ceremony during Mississippi State football’s contest versus Louisiana. Kickoff is set for 6:30 p.m. CT. Wilcox will become the first female student-athlete in Mississippi State history to have her jersey retired. On Sunday, Sept. 16, Mississippi State will honor Wilcox’s legacy with an on-campus memorial service officiated by M-Club director Tyson Lee. The service is scheduled to begin at 10 a.m. inside the Chapel of Memories and will feature video tributes as well as members of MSU softball speaking on Wilcox’s impact both on and off the field. The event is open to the public. Diagnosed with ovarian cancer in 2015, Wilcox defied the odds and continued to play softball throughout her treatments and helped lead Brantley High School to multiple state championships. Wilcox signed with the Bulldogs in 2016. Over her freshman campaign, Wilcox continued her fight with cancer while continuing to pursue her dreams of playing collegiate softball. She sparkled during the fall season, displaying her ability at the plate with home run power. Despite being in the midst of chemotherapy treatments, Wilcox appeared in eight contests with three starts over her freshman season. She recorded three hits in her 15 at bats, including her first collegiate hit against UMass Lowell in March. Balancing a full academic course load, Wilcox was named to the SEC Honor Roll this spring. Mississippi State softball rallied around Wilcox throughout the 2018 season with its “No One Fights Alone” campaign as the program wore teal uniforms during midweek contests to spread awareness for ovarian cancer and Wilcox’s fight. Wilcox’s constant positivity and determination throughout her battle drew support and praise from legends in the softball community like Olympians Michele Smith and Jessica Mendoza. The campaign sparked fire as teams across the Southeastern Conference and the country rallied around Wilcox by wearing teal and sending messages of love and support. For their selfless efforts to support, all 13 SEC softball programs were awarded the league’s Sportsmanship Award in June. Wilcox passed away in her hometown of Brantley, Alabama, on June 25. She was 18.